These are the 7 trumpets mentioned in Revelation chapter 8:1-2 (see Bible reference below ), which mighty angels blow and judgements occur on the earth according to God’s will. After each one is sounded, a particular event occurs on the earth, which lead me to think it would be great to have each trumpet designed with surface detail which would reflect the judgement coming upon the earth. For example after the first trumpet is sounded hail and fire mixed with blood was hurled down upon the earth, so the first trumpet I have drawn has lightning embossed on the trumpet, with little hailstones and the end of the trumpet has a fiery pattern to it. 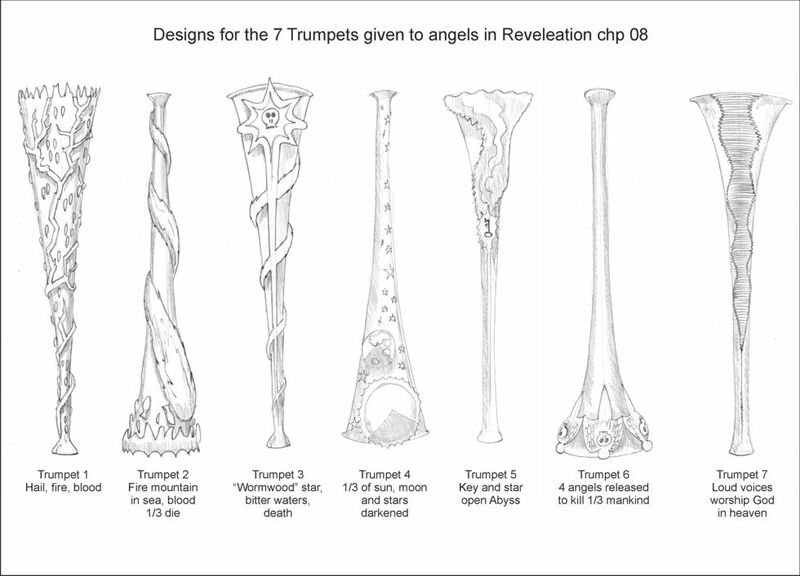 I read Revelation 8-11 in order to discover what particular events happened on earth after each one is blown, and then drew a design on the surface of each trumpet to match the events. 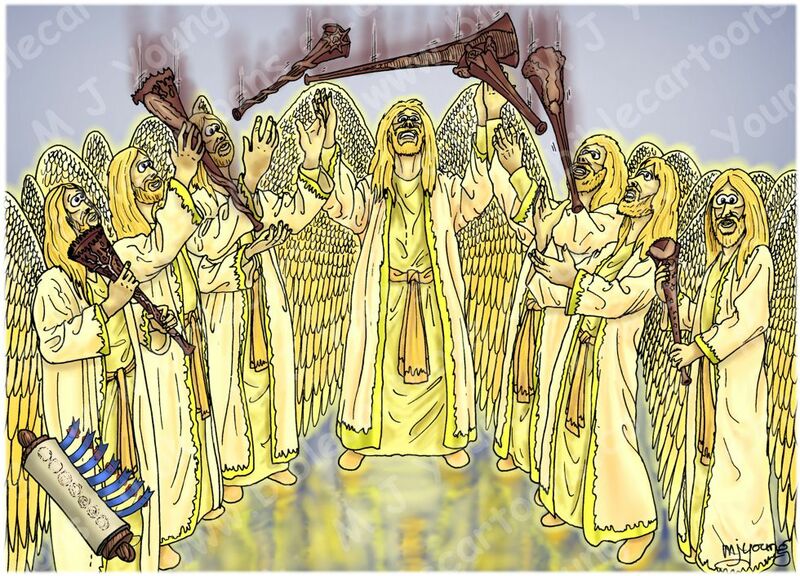 All 7 of these trumpets can be seen in the Bible Cartoon below, which has an orange text box link below it, so you can see the cartoon on the gallery page. Note: there are two versions of this Bible Cartoon, but the only difference between them is the inclusion or absence of the scroll in the bottom left hand corner. 1 The fifth angel sounded his trumpet, and I saw a star that had fallen from the sky to the earth. The star was given the key to the shaft of the Abyss. 2 When he opened the Abyss, smoke rose from it like the smoke from a gigantic furnace. The sun and sky were darkened by the smoke from the Abyss. 3 And out of the smoke locusts came down upon the earth and were given power like that of scorpions of the earth. 4 They were told not to harm the grass of the earth or any plant or tree, but only those people who did not have the seal of God on their foreheads. 5 They were not given power to kill them, but only to torture them for five months. And the agony they suffered was like that of the sting of a scorpion when it strikes a man. 6 During those days men will seek death, but will not find it; they will long to die, but death will elude them. 7 The locusts looked like horses prepared for battle. On their heads they wore something like crowns of gold, and their faces resembled human faces. 8 Their hair was like women’s hair, and their teeth were like lions’ teeth. 9 They had breastplates like breastplates of iron, and the sound of their wings was like the thundering of many horses and chariots rushing into battle. 10 They had tails and stings like scorpions, and in their tails they had power to torment people for five months. 11 They had as king over them the angel of the Abyss, whose name in Hebrew is Abaddon, and in Greek, Apollyon. 13 The sixth angel sounded his trumpet, and I heard a voice coming from the horns of the golden altar that is before God. 14 It said to the sixth angel who had the trumpet, “Release the four angels who are bound at the great river Euphrates.” 15 And the four angels who had been kept ready for this very hour and day and month and year were released to kill a third of mankind. 16 The number of the mounted troops was two hundred million. I heard their number.